A seasoning mix with onions and herbs for lamb hotpot. 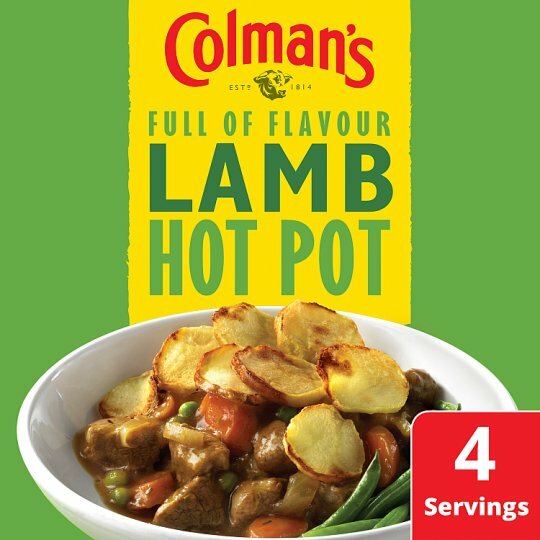 This packet of Colman's Lamb Hotpot seasoning mix helps you create tasty, hearty meals for the whole family to enjoy. Containing a carefully selected blend of herbs and spices, it has never been easier to serve up ‘meals that say it all'. Using the fresh ingredients from the shopping list below, follow the four easy steps on the back of the recipe mix packet and you can rest assured that you'll bring smiles to the whole family at dinner time. Preheat the oven to 180°C, 170°C fan assisted, Gas Mark 4. Heat the oil in a frying pan and fry the lamb and onions until browned. Place in an ovenproof casserole dish with the carrots and peas. Blend the contents of the sachet with the water and add to the dish. Place a layer of potatoes on top. Cover and cook in the oven for 2 hours or until lamb is tender. Remove the casserole lid 30 minutes from the end of cooking to crisp up the potatoes. Enjoy with seasonal vegetables. Why not try serving your Lamb Hotpot with seasonal vegetables. Quickly create a hearty lamb hotpot that will satisfy the whole family! Step 1: Oven Preheat the oven to 180°C, 170°C fan assisted, Gas mark 4. Step 2: casserole dish Heat the oil in a frying pan and fry the lamb and onions until browned. Place in an ovenproof casserole dish with the carrots and peas. Step 3: mixing jug Blend the contents of the sachet with the water and add to the dish. Place a layer of potatoes on top. Step 4: casserole dish Cover and cook in the oven for 2 hours or until lamb is tender. Remove the casserole lid 30 minutes from the end of cooking to crisp up the potatoes. Enjoy with seasonal vegetables.